Perhaps you won’t actually know his name, but if you’ve any interest in the jazz, soul, pop, folk, blues or Brazilian music of the 1960s and 70s, then you will almost certainly have heard either the songs or the piano playing of Bobby Scott. Take ‘A taste of honey’, recorded by the Beatles for their first LP – that’s one of Bobby’s. ‘He ain’t heavy, he’s my brother’, another. Following on from his previous book, A moment worth waiting for, which focussed on the early 1980s and took the equally adventurous Vic Godard as its touchstone, here Kevin Pearce traces an insightful and alternative path through the music of the two previous decades – alternative in the sense that Bobby Scott and many of the singers and musicians with whom he worked have not been anything like as celebrated as they deserve to be. Bobby Scott’s approach was genre-blind if not genre-busting, illustrative of the plurality, interconnectedness, and cross-pollinating tendencies of a certain type of musical adventurer. He was, in the best sense of the word, a mastermind, but one who never lost sight of the gifts which individual singers possessed. This was a man who packed a lot of living into too short a life. From precocious and energetic youth to grey-bearded patrician, Bobby composed, arranged, conducted, produced, sang, and played on countless sets of music, working with an amazing cast of fellow musicians and singers, including Bobby Darin, Jackie Paris, Chet Baker, Roland Kirk, Quincy Jones, Aretha Franklin, Timi Yuro, Nana Mouskouri, Esther Ofarim, Catherine Howe, Luiz Bonfá, Eumir Deodato, Marvin Gaye, and Dionne Warwick – and just as many less well-known performers, each treated by the writer on the merits of the work they left behind rather than plaudits gathered along the way. It’s a journey which You know my name maps in meticulous detail and with great affection, building a portrait of a gifted, fascinating, and generous man, as well as a rich and enlightening history of the music of the times. Among others, Astrud Gilberto, Stan Getz, Gary McFarland and Lalo Schifrin all also feature prominently in the story as it diverges from its central character to record the influential effect that Brazilian bossa nova had on music in the United States from the early 1960s onwards. The book becomes an evocation of the depth, breadth and staying power of the great American and Brazilian songbooks, and in so doing, an extended treatise on the art of singing. 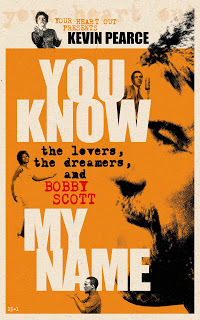 Bobby Scott – himself a vocalist of raw emotional power – is rightfully rescued from the cracks in history down which he has fallen, and along with him, dozens of fine singers and musicians worthy of far greater attention than they received at the time. Enter your email address to follow A jumped-up pantry boy and receive notifications of new posts by email.